Where does the time fly? Is it possible that we have traded in the candy that filled our pails for turkey on our plates? 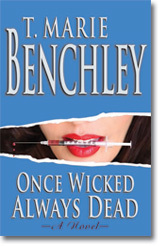 Life for me is a whirlwind as I have been on tour and signing copies of my hard cover Once Wicked Always Dead. I really need to give a shout out to all the wonderful book stores who have so graciously allowed me to come in and spend time with them and all my readers. For me there is nothing better then surrounding myself around books, people and cafe’ moca’s! Thank you all from the bottom of my heart! I would now like to touch on a more serious nature. After watching the news last night (Anyone who knows me understands that I am a huge news junkie!) I saw something very disturbing, and yes, I feel the need to touch on this subject! Apparently there is an Author (I don’t even want to put Author as a title to this mentally, problematic person) but he wrote a how to for Pedophiles. He was able to e-pub the trash and Amazon offered it for sale on their site. After much protest Amazon removed it and the Author was interviewed by reporters. I watched those interviews and believe me when I tell you, the man is definitely out to lunch and a danger not only to children but to society! The big debate has been freedom of speech. As an Author, I am all for freedom of speech but as human beings we also need to be held responsible for our actions. The actions taken by this man are harmful, not only for what he has written, but also in his belief that it’s ok to take the innocence from our youth and put so many children in serious jepordy but also help in furthering breaking down the moral fibers in our country. He is telling very troubled, individuals that their own perverse desires, should be act upon without any consequences or concern for the detrimental damage it would cause to our children! In this particular case, freedom of speech should be thrown out the window! If the government wishes to control and make decisions over what we feed our children or eliminate toys in Happy Meals, why don’t they do something about this! Come on people, have we have gone so far over the spectrum that we have lost all common sense? So I would like to say to Mr so called Author, don’t be surprise if you receive your free copy of Once Wicked Always Dead, I think Leeza would like to meet you. You seem to be just what she is ridding the world of!